The attached column by Pat Buchanan (below) could not be more spot on. It slices through the misbegotten assumption that Saudi Arabia is our ally and that the safety and security of the citizens of Lincoln NE, Spokane WA and Springfield MA have anything to do with the religious and political machinations of Riyadh and its conflicts with Iran and the rest of the Shiite world. Nor is this only a recent development. In fact, for more than four decades Washington’s middle eastern policy has been dead wrong and increasingly counter-productive and destructive. The crisis provoked this past weekend by the 30-year old hot-headed Saudi prince, who is son of the King and heir to the throne, only clarified what has long been true. That is, Washington’s Mideast policy is predicated on the assumption that the answer to high oil prices and energy security is deployment of the Fifth Fleet to the Persian Gulf. And that an associated alliance with one of the most corrupt, despotic, avaricious and benighted tyrannies in the modern world is the lynch pin to regional stability and US national security. Nothing could be further from the truth. The House of Saud is a scourge on mankind that would have been eliminated decades ago, save for Imperial Washington’s deplorable coddling and massive transfer of arms and political support. At the same time, the answer to high oil prices is high oil prices. Could anything not be more obvious than today when crude oil is hovering around $35 per barrel notwithstanding a near state of war in the Persian Gulf? Here’s the thing. The planet was endowed by the geologic ages with a massive trove of stored energy in the form of buried hydrocarbons; and it is showered daily by even more energy in the form of the solar, tidal and wind systems which shroud the earth. The only issue is price, the shape and slope of the supply curve and the rate at which technological progress and human ingenuity drives down the real cost of extraction and conversion. 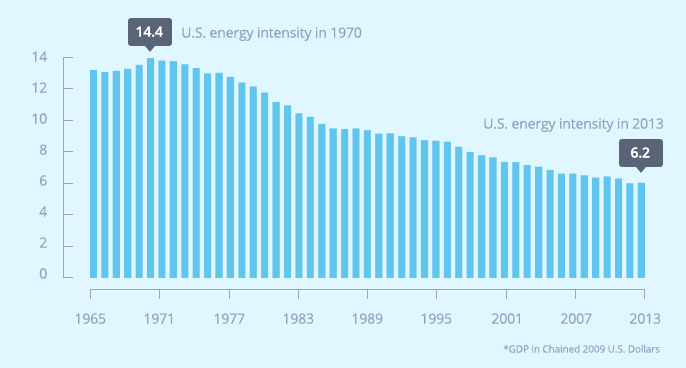 On top of that, the vast resilient forces of the free market have silently, steadily and dramatically improved the energy efficiency of the US economy. As shown in the long term chart below, energy consumption per dollar of GDP is only about 40% of the level which obtained when Washington’s politicians first started running around like Chicken Little, claiming that the energy sky was falling at the time of the so-called 1973 oil crisis. Driven by the supply and demand curves of the ordinary processes of economic markets over the last four decades, therefore, the constant dollar price of oil has gone absolutely nowhere. The threat of high oil prices has been a giant myth all along. 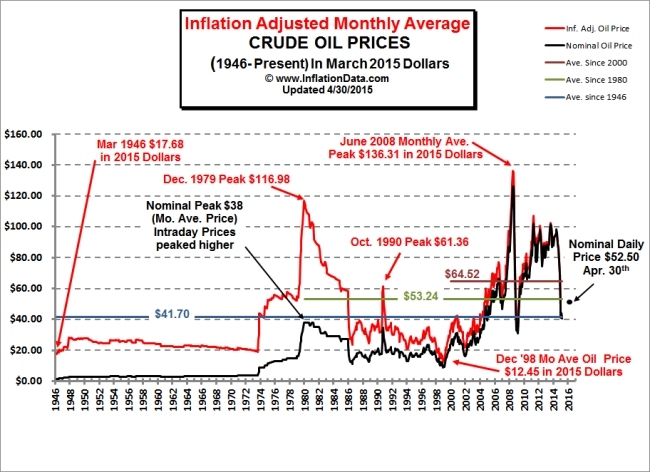 The red line in the chart below expresses the world crude oil price in March 2015 dollars of purchasing power. At today’s $35 per barrel it is only marginally higher than it was in 1971 before Nixon slammed shut the gold window and inaugurated four decades of central bank fueled monetary inflation. The truth is, the long era of the so-called oil crisis never happened. It was only a convenient Washington invention that was used to justify statist regulation and subsidization of energy domestically and interventionist political and military policies abroad. Back in the late 1970s as a member of the House Energy Committee I argued that the solution to high oil prices was the free market; and that if politicians really wanted to cushion the purely short-term economic blow of a Persian Gulf supply interruption the easy and efficient answer was not aircraft carriers, price controls and alternative energy subsidies, but the Texas and Louisiana salt domes that could be easily filled as a strategic petroleum reserve (called SPRO). During the Reagan era we unleashed the energy pricing mechanisms from the bipartisan regime of price and allocation controls which had arisen in the 1970s and began a determined campaign to fill the SPRO. Thirty-five years later we have a full SPRO and a domestic and world economy that is chock-a-block with cheap energy because the pricing mechanism has done its job. In fact, OPEC is dead as a doornail, and the real truth has now come out. Namely, there never was a real oil cartel. It was just the House of Saud playing rope-a-dope with Washington, and its national oil company trying to do exactly what every other global oil major does. That is, invest and produce at rates which are calculated to maximize the present value of its underground reserves. And that includes producing upwards of 10 million barrels per day at present, even as the real price of oil has relapsed to 50 year ago levels. What this also means is that Imperial Washington’s pro-Saudi foreign policy is a vestigial relic of the supreme economic ignorance that Henry Kissinger and his successors at the State Department and in the national security apparatus brought to the table decade after decade. Had they understood the energy pricing mechanism and the logic of SPRO, the Fifth Fleet would never have been deployed to the Persian Gulf. There also never would have been any Washington intervention in the petty 1990 squabble between Saddam Hussein and the Emir of Kuwait over directional drilling in the Rumaila oilfield that straddled their historically artificial borders. Nor would there have been any “crusader” boots trampling the allegedly sacred lands of Arabia or subsequent conversion of Bin-Laden’s fanatical Sunni mujahedeen, which the CIA had trained and armed in Afghanistan, to the al-Qaeda terrorists who perpetrated 9/11. Needless to say, the massive US “shock and awe” invasion thereafter which destroyed the tenuous Sunni-Shiite-Kurd coexistence under the Baathist secularism of Saddam Hussein would not have happened, either. Nor would the neocon war mongers have ever become such a dominant force in Imperial Washington and led it to the supreme insanity of regime change in Libya, Syria, Yemen and beyond. In short, the massive blowback and episodic eruptions of jihadist terrorism in Europe and even America that plague the world today would not have occurred save for the foolish policy of Fifth Fleet based energy policy. Still, there is an even more deleterious consequence of the Kissinger Error. Namely, it has allowed the House of Saud, along with Bibi Netanyahu’s political machine, to egregiously mis-define the sectarian and tribal conflicts which rage in today’s middle-east. The fact is, there is no such thing as generic Islamic terrorism. The overwhelming share of the world’s 1.3 billion or so Sunni Muslims are not remotely interested in Jihaddism. Likewise, the 200 million adherents of the Shiite Muslim confession are not terrorists in any religious or ideological sense. There are about 60 million Shiite in India and Pakistan and their quarrel, if any, is rooted in antagonisms with Hindu-India, not the West or the US. Similarly, the 80 million Shiite domiciled in Iran, southern Iraq, southern Lebanon and the Alawite communities of Syria have been host to sporadic terrorist tactics. But these occurred overwhelmingly in response to efforts by outside powers to occupy Shiite communities and lands. That is certainly the case with the 20-year Israeli occupation of southern Lebanon, which gave rise to Hezbollah defense forces. It is also true of the Shiite uprisings in Baghdad and southern Iraq, which gave rise to the various militias that opposed the US occupation. Moreover, post-1979 Iran has never invaded anyone, nor have the Shiite communities of northern Yemen, who are now being bombarded by Saudi pilots driving US supplied war planes and drones. In short, there has never been a Shiite-based ideological or religious attack on the West. The anti-Americanism of the Iranian theocracy is simply a form of crude patriotism that arose out of Washington’s support for the brutal and larcenous regime of the Shah—–and which was reinforced during Iraq’s US aided invasion of Iran during the 1980s. By contrast, the real jihadi terrorism in the contemporary world arose almost exclusively from the barbaric fundamentalism of the Sunni-Wahhabi branch of Islam, which is home-based in Saudi Arabia. Yet this benighted form of medieval religious fanaticism survives only because the Saudi regime enforces it by the sword of its legal system; showers its domestic clergy with the bounty of its oil earnings; and exports hundreds of millions to jihadists in Syria, Iraq, Libya, Turkey, Iran, Egypt and numerous other hot spots in the greater middle east. At the end of the day, the House of Saud is also the ultimate inspiration and financial benefactor of the Islamic State, as well. Had it not provided billions in weapons and aid to the Syrian rebels over the last five years, there would be no civil war in Syria today, nor would ISIS have been able to occupy the dusty, impoverished towns and villages of the Upper Euphrates Valley where it has established its blood-thirsty caliphate. So this weekend’s execution of a Saudi Shiite cleric who never owned a gun or incited anything other than peaceful protest among the downtrodden Shiite communities of eastern Arabia is truly the final straw. It was a deliberate provocation by a reprehensible regime that has so thoroughly corrupted the War Party that it even managed to have Washington shill for its preposterous appointment to head of the UN Commission on Human Rights! During the last several decades Washington has financed more than $100 billion of arms sales to the House of Saud. Accordingly, there is one simple way to clean the slate in the middle east and put an eventual end to Wahhabi Jihaddism. That is, cut off arms sales entirely to the Saudi military, which would be grounded within months due to lack of spare parts and support services. Indeed, the mere announcement would send several thousand Saudi princes and their families scurrying for their 747s and escape to Switzerland, London, New York and other fleshpots of the West. After an abdication by the House of Saud, the Wahhabi clerics would not long survive, and Iran and its Shiite Crescent allies, including Russia, would make short work of the ISIS caliphate. And whatever government emerged on the Arabian peninsula, one thing is certain. It would need to produce all the oil it can, but at least the proceeds at even today’s $35 per barrel price would have a decent chance of benefiting the nation’s 30 million citizens rather than the unspeakable opulence and decadence of a few thousand princes. That actually happened in Iran when the mullahs—as religiously rigid and backwards as they might be—–overthrew the megalomaniacal tyrant who sat on the Peacock Throne. 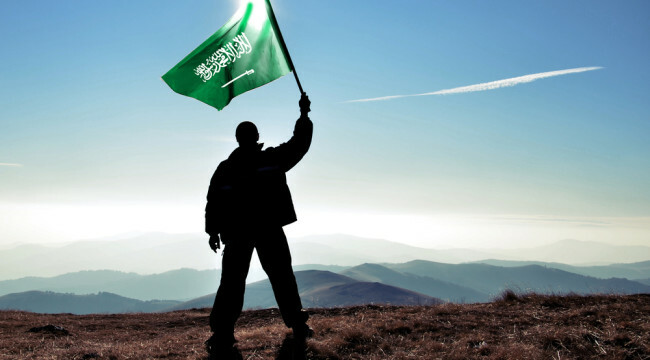 It’s time that the House of Saud found its way into the dustbin of history, as well. The Washington Post was disgusted. In an editorial, “A Reckless Regime,” it called the execution risky, ruthless and unjustified. “We have no permanent allies … no permanent enemies … only permanent interests” is a loose translation of the dictum of the 19th century British Prime Minister Lord Palmerston.